Guess what? The Daemon Parallel is currently Book of the Month on the Scottish Book Trust website. That means you’ve got until the end of June – nearly two weeks – to answer a really easy question, and have a chance of winning a copy. I really should’ve told you about this sooner, but the truth is, I’ve been a bit distracted. 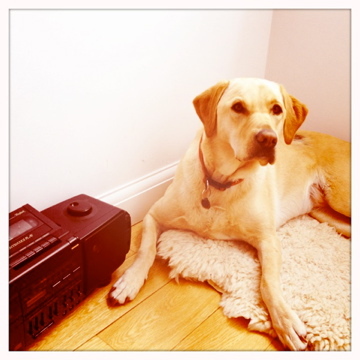 I currently have a Very Important House Guest, in the shape of Tanya the dog – a very lovable, very energetic yellow lab. You can see her in the picture below – that’s her “Why are you staring at that computer? Why aren’t you paying attention to ME?” face. I get to see it quite often – and it’s my cue to down word-processors, shut down the mac, and for us to head off to the park to chase squirrels and charm random strangers (the dog is slightly better at both of these things than me…). So if you’ve been wondering why I haven’t been blogging, blame Tanya. But she’s kind of hard to get mad at – don’t you agree?